The M3 Stuart, formallyLight Tank M3, was an American light tank of World War II and supplied to British and Commonwealth forces under lend-lease prior to the entry of the USA into the war—and used thereafter by US and Allied forces until the end of the war. The name General Stuart or Stuart given by the British comes from the American Civil War Confederate General J.E.B. Stuart and was used for both the M3 and the derivative M5 Light Tank. In British service it also had the unofficial nickname of Honey after a tank driver remarked "She's a honey". To the United States Army the tanks were officially known only as "Light Tank M3" and "Light Tank M5". The M3 Stuarts were the first American manned (US) tanks in World War II to engage the enemy in tank versus tank combat. Many were also provided to the Soviets. The Soviets considered it undergunned, underarmored, likely to catch fire, and too sensitive to fuel quality. The narrow tracks were highly unsuited to operation in winter conditions, as they resulted in high ground pressures under which the tank sank into the snow. Further, the M3's radial aircraft engine required high-octane fuel, which complicated Soviet logistics as most of their tanks used diesel. However, the M3 was superior to early-war Soviet light tanks such as the T-60, which were often underpowered and possessed even lighter armament than the Stuart. In 1943, the Red Army tried out the M5 and decided that the upgraded design was not much better than the M3. Being less desperate than in 1941, the Soviets turned down an American offer to supply the M5. M3s continued in Red Army service at least until 1944. 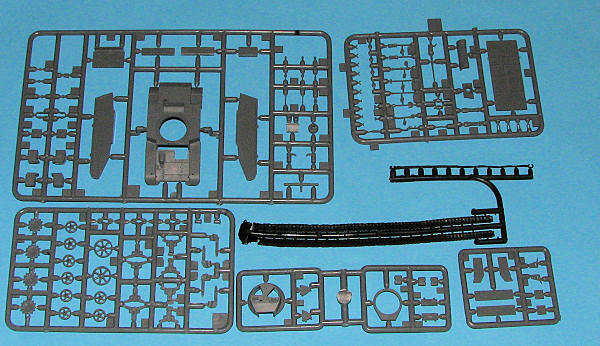 The kit is molded on five injected plastic sprues of varying sizes and one sprue of vinyl for the tracks and the tow cable. Inspection of the parts found two sink holes that will be invisible once the kit is built, and ejector pin marks on the sides of the tank where the suspension pieces attach. The builder may want to fill or sand away these as they may be visible in the final product. Mirage has provided quite a lot of pieces for a tank of this size. There are a myriad of pieces that will attach on the outside of the hull and the kit includes numerous very small hand holds to attach to various areas of the tank. This is a curbside and there is no interior detail, though the two turret hatches could be displayed open if one wished. Suspension pieces are well done for the scale and though the tracks and tow rope appear to be vinyl, they also could be deformable styrene. Instructions are a semi-3D photo-realistic type though they are somewhat lacking depth in a few illustrations. Mirage has used glossy paper for this one and all of the parts are clearly shown. Color is by Vallejo references, though each option is pretty well Dark Green, as if they were painted when received. However, this isn't the case as most of the markings options still have the blue serial stencils that were placed on the tanks when with the US Army. I'd lean more to a greenish OD for overall color. No color info is provided during the build up. 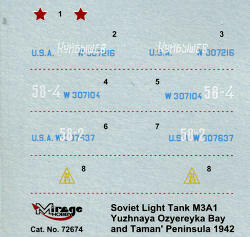 Decals are for four tanks, each with Soviet markings over the standard US ones when the tank was delivered. All are from the 1943 time period. 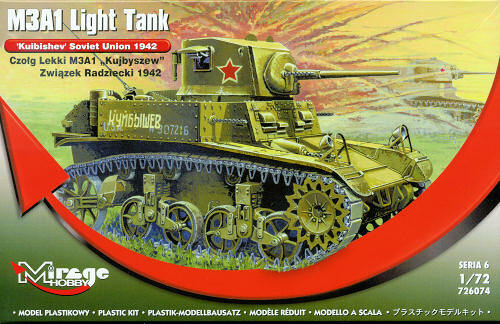 It really looks like a nice kit and should build into a very nice model. I'd recommend this one for people who have graduated from the more simple Hasegawa 1/72 armor as there are quite a few small pieces.